Phase One performed at Shackerstone festival for the 4th consecutive year this September, entertaining crowds in the beer tent on both Saturday and Sunday. The sun shone and we’re looking forward to next year already! Phase One Steel Orchestra and the Steel Pan Academy travelled to Belgium this July to perform in the world famous Ghent Festival. We performed on the main stage of Sint Baaf Square to quite an audience! Whilst in Belgium, we also performed at Wapenplein bandstand in Oostende and Leopold Esplanade in De Panne. Phase One Steel Orchestra performing at the Cocked Hat in Coventry fundraising for children with Down Syndrome. There were two types of entertainment this evening, Phase One and a group of Brazilian dancers. Both performed throughout the night and came together for a limbo finale. 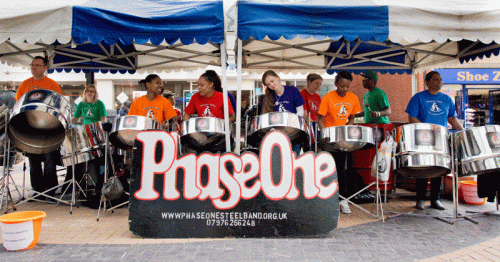 Phase One Steel Orchestra performing in Nuneaton Town Centre, for the Mayor of Nuneaton. Phase One performed at the annual Shackerstone festival on the 3rd & 4th September 2011. they’ll be performing again this year for the sixth consecutive year! Phase One took part in the Godiva Festival carnival procession in Coventry again this year. The rain held off and the crowds were out in force. Phase One went with the Steel Pan Academy on tour to Lake Garda, Italy in July of 2011. Phase One performed at the Coventry Caribbean Festival held in the Memorial Park in July. Phase One took part in the Godiva Festival carnival procession in Coventry this weekend. Live music in the procession included Coventry’s Dave Barrett & Drumestra, Dhol drummers, Phase One Steel Band, Triumph RBL Pipe Band, and guest band – Bloco Fogo from the South East playing Brazilian, Cuban and African Rhythms. Phase One toured in Paris in 2009 with The Steel Pan Academy, here are some photographs of our performances in the Jardin du Luxembourg and the grounds of the Eiffel Tower. Phase One toured Barcelona in 2007 with the Steel Pan Academy, here are some photographs of us performing on the steps of the cathedral at Tibidabo and at the Barcelona Water Park.